India's capital city, Delhi depicts the myriad colours of different kinds of lifestyles that are a mix of contemporary and traditional sensibilities. It is a reservoir of cultures, traditions and politics. A visit to its several architectural masterpieces of ancient and medieval times, is always a delight. 1600 HRS: Reporting at Safdarjung Railway Station for check in formalities. 1830 HRS: Leaving for Jaipur. 1930 HRS: Dinner aboard the royal Palace on Wheels. Founded in 1727 and the former capital of the Kachwaha rulers, Jaipur today is a versatile tourist destination. Famed as the 'Pink City', this capital city of Rajasthan boasts of a rich historical past that is depicted in its forts, palaces, havelis and its colourful bazaars. 0345 HRS: Arrive in Jaipur. 0700 HRS: Refreshing breakfast onboard Palace on Wheels India. 0800 HRS: Traditional welcome ritual at the Jaipur Railway Station. 0830 HRS: De-board the train for an excursion tour to the city. 1330 HRS: A tantalizing lunch at the Amber Fort. 1500 HRS: A explorative tour to Amber Fort. 1630 HRS: A tour to the local markets. 1800 HRS: Embark the train again for tea and leisure. 1900 HRS: Returning back to Jaipur. 2000 HRS: A grand dinner at the Jai Mahal Palace. 2200 HRS: Returning to Palace on Wheels for onward journey to Sawai Madhopur. Sawai Madhopur is a beautiful city of Rajasthan, which is extremely popular for housing the world-renowned Ranthambore National Park. The UNESCO World Heritage Site of the historic Ranthambore Fort is an added attraction. It was a planned city that was founded by Maharaja Sawai Madho Singh I of Jaipur. Popular for the tales of valour and romance of its erstwhile royalty, Chittorgarh was the former capital of the Sisodia clan of Mewar. Placed on the banks of rivers Gambhiri and Berach, this city has magnificent forts, ruined castles and glorious royal structures. 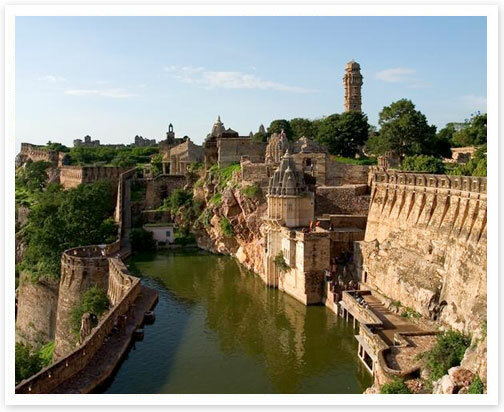 Chittorgarh has a total of 7 huge entries. 0530 HRS: Arrival in the Railway Station of Sawai Madhopur. 0600 HRS: Starting an early morning jungle safari to the adventurous Ranthambore National Park. 0915 HRS: A breakfast in a forest lodge. 1000 HRS: Return back to Palace on Wheels. 1030 HRS: A departing journey to Chittorgarh. 1300 HRS: A royal lunch aboard Palace on Wheels. 1600 HRS: Arrival in Chittorgarh. 1630 HRS: A sightseeing tour to the Chittorgarh Fort. 1800 HRS: Evening tea and other refreshments at the cafeteria of Chittorgarh Fort accompanied by a beautiful light and sound show. 1930 HRS: Return back to the royal Palace on Wheels. 2000 HRS: A royal dinner at hotel Panna along with a cultural show. 2200 HRS: Returning back to the royal carriages of the train for an overnight stay. 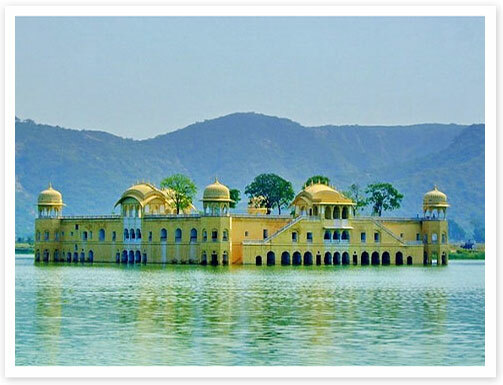 Also known as the 'City of Lakes' Udaipur is called Rajasthan's most romantic city because of its picturesque setting, Rajputana palaces and lakes. 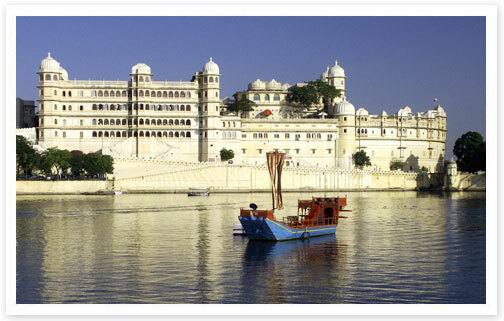 The erstwhile capital of the Mewar kingdom, Udaipur was founded in 1553 by Maharana Udai Singh II. 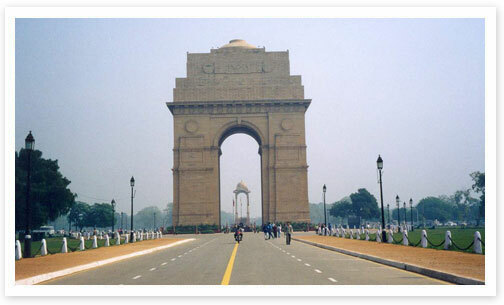 The city boasts of innumerable tourist attractions. 0200 HRS: Leaving Chittorgarh for an onward journey to Udaipur. 0800 HRS: Arrival in the lake city Udaipur. 0815 HRS: A refreshing breakfast in a deluxe hotel. 0900 HRS: Off-train excursion tours to the city attractions. 1330 HRS: A stately lunch in a heritage hotel. 1430 HRS: A venturous boat ride in the lake Pichola. 1500 HRS: Back to the railway station. 1530 HRS: Evening tea accompanies by refreshments onboard Palace on Wheels Onward journey to Jaisalmer. 1930 HRS: A deluxe dinner aboard Palace on Wheels. 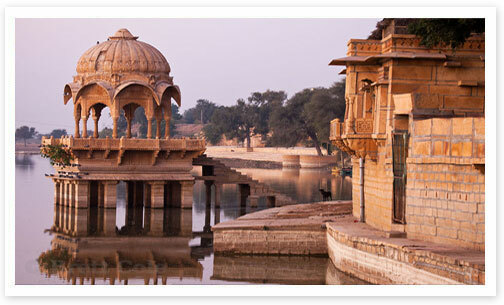 Nicknamed as the Golden City, the city of Jaisalmer is very well-known for its Jaisalmer fort. This city has been named after Maharawal Jaisal Singh, a Rajput ruler who had established the city in 1156 AD. The city every year hosts its annual Dessert Festival, which is a major crowd puller. 0730 HRS: A rejuvenating break on the go. 0915 HRS: Disembark in Jaisalmer for a sightseeing tour to the city. 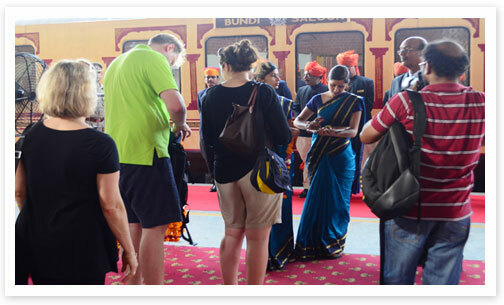 1330 HRS: Either an onboard lunch in Palace on Wheels or at the deluxe Moomal hotel. 1530 HRS: Tea and refreshments in the sand dunes of Jaisalmer along with a camel ride. 1930 HRS: A royal dinner in the sand dunes accompanied by a colorful cultural program. 2300 HRS: Returning back to the train for an onward journey to Jodhpur. 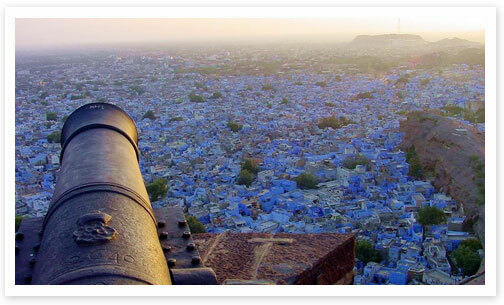 Also known as the 'Sun City' and the 'Blue City', Jodhpur was the erstwhile capital city of the kingdom of Marwar. Now a popular tourist destination, this city is quite famous for its proximity to the Thar desert and for its magnificent forts. It is dotted with innumerable attractions, worth visiting. 0700 HRS: Reaching the Jodhpur Railway Station. 0730 HRS: An onboard breakfast in Palace on Wheels. 0900 HRS: A tour to the city attractions of Jodhpur. 1400 HRS: Lunch in a deluxe resort. 1530 HRS: Return back to the train for relaxing and a ride to Bharatpur. 1930 HRS: A dinner onboard royal Palace on Wheels. Considered to be an impregnable city, Bharatpur was the erstwhile capital of the Jat Kingdom and now is a famous tourist destination. Also called Lohagarh, this city houses the very well-known Keoladeo Ghana National Park or Bharatpur Bird Sanctuary. This sanctuary is a haven for bird watchers. Situated on the banks of river Yamuna, the Mughal city of Agra also finds its mention in the Hindu epic of Mahabharat. The city houses 3 UNESCO World Heritage Sites, including the Taj Mahal, one of the Seven Wonders of the World. The city is a blend of the old and the new worlds. 0500 HRS: Arrive at Bharatpur. 0600 HRS: Leaving for Keoladeo Ghana National Park for an early morning bird viewing. 0730 HRS: A breakfast in a deluxe lodge in the forest. 0830 HRS: Returning back to the train. 0845 HRS: A journey to Agra. 1030 HRS: Arrival in Agra. 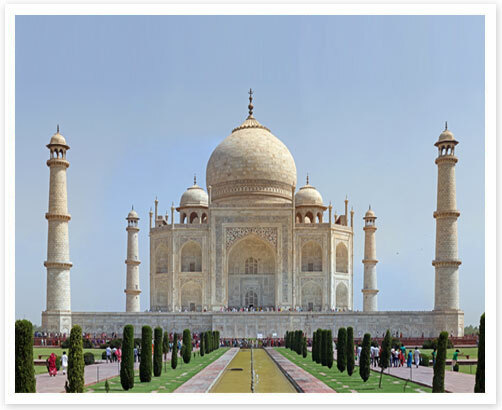 1100 HRS: A city sightseeing tour to Agra. 1330 HRS: A delightful lunch in a deluxe hotel in Agra. 1500 HRS: Exploring the beauty of Taj Mahal. 1730 HRS: A roam to the city market. 1830 HRS: Savoring a light and sound show. 2000 HRS: Dinner in a luxury hotel in the city or aboard Palace on Wheels. 2300 HRS: Returning journey to Delhi. 0400 HRS: Arrival in the Safdarjung Railway Station. 0730 HRS: An onboard breakfast followed by checkout and farewell formality.